"I am going to fulfil my mother’s dreams and support her like she supported me." Nirmal’s mother has been her strongest pillar in her journey. Her father did not support her getting an education past eighth standard. Her mother convinced her father to allow her to go for higher studies. I am going to fulfil my mother’s dreams and support her like she supported me. Nirmal’s mother has been her strongest pillar in her journey. Her father did not support her getting an education past eighth standard. Her mother convinced her father to allow her to go for higher studies. 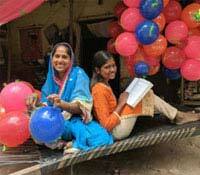 Born and bought up in a slum in Delhi sending a girl to school was not exactly a piece of cake but Nirmal and her mother were ready to face the hurdles together. From being a little child dreaming of going to school to becoming a strong and courageous girl Nirmal has come a long way struggling to be successful. Smile Foundation’s Swabhiman scholarship allowed Nirmal to be more fearless towards financial issues hampering her studies. 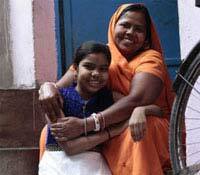 Nirmal is currently studying in Class 10 and aspires to study more to fulfil all her mother’s dreams. Her parents are very proud of her and encourage her more every day. "I want to improve the conditions that my parents live in. I am working towards it." Last year, Yogita was awarded with a merit-based scholarship under Smile Foundation’s Swabhiman programme to help her complete her schooling and higher studies. I want to improve the conditions that my parents live in. I am working towards it. Last year, Yogita was awarded with a merit-based scholarship under Smile Foundation’s Swabhiman programme to help her complete her schooling and higher studies. She belongs to a family who work hard yet struggle to make ends meet. 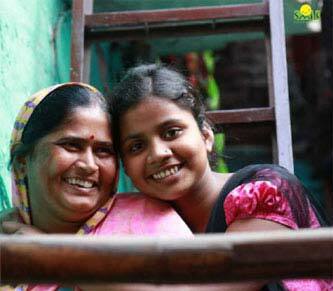 Yogita’s mother Kiran works as a maid washing dishes, cleaning and mopping 5-6 houses every day. In the evening she packs plastic balls meant to be played with by little children and sells them at traffic signals. 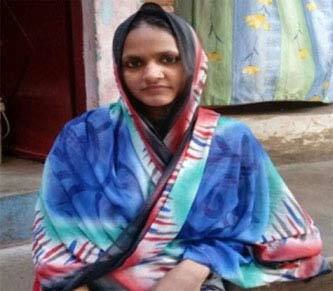 Even though she is illiterate herself, Kiran ensured that her three daughters went to school. 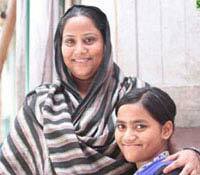 It is a fruit of her efforts that her eldest daughter Yogita has always been a class topper. Whether it is the burning sun, heavy rains or biting cold, both parents never take a single day off just so that their daughters can have an easier life and do not have to struggle daily like them. The scholarship is a hope for me & my family because this is the only support by which I can complete my studies. Swabhiman scholarship has enabled Pinki and her mother to dream big like 81 other young, spirited and extremely talented girls from slum clusters around Delhi have been awarded merit-based scholarship to complete their schooling and higher studies under Smile Foundation’s Swabhiman programme. “She has truly been a mother to me, and also a guardian for my child. When he was born healthy and fit, didi too had tears in her eyes"
Both Kamla and her husband are uneducated and neither are they aware about the need of healthy and nutritious food for an expecting mother. She has truly been a mother to me, and also a guardian for my child. When he was born healthy and fit, didi too had tears in her eyes. Both Kamla and her husband are uneducated and neither are they aware about the need of healthy and nutritious food for an expecting mother. A few months after Kamla conceived she became pale and sick. Her husband could not take proper care of her as he was a daily wage earner, losing a day’s wage meant no food for them. Kamla’s condition improved when Aruna has been working as a health volunteer under Smile Foundation’s Swabhiman programme came to her rescue. She counselled both Kmala and her husband regularly and made them aware of how nutritious food could be eaten even if they had less money. Kamla, under Aruna’s strict supervision gave birth to a healthy baby boy recently. Uma’s mother is her greatest pillar of support. When her father lost his job four years ago Uma’s mother started to work as a maid. I will work as hard as my parents do now so that they can rest when I get a job. Uma’s mother is her greatest pillar of support. When her father lost his job four years ago Uma’s mother started to work as a maid. She began to support the entire family and also supported Uma’s education, not even allowing her do the household work. As a result Uma began to excel in her studies and was awarded the Swabhiman scholarship. She is one of the 92 exceptionally talented girls who were awarded scholarship last year to complete their higher education under Smile Foundation’s Swabhiman programme. Uma dreams of completing her studies and securing a good job so that she can support her parents and make them happier. 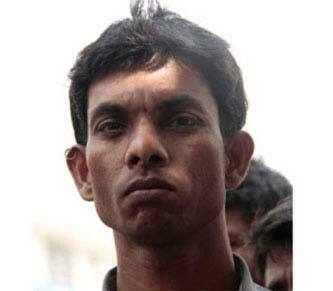 Shahin, is a 26 year old resident of Mahatma Gandhi Camp. She has 3 children, two boys aged 8 and 7 years and a girl aged 3 year. I was made aware that taking care of my three children was more important than conceiving repeatedly. I am glad I was made aware. Shahin, is a 26 year old resident of Mahatma Gandhi Camp. She has 3 children, two boys aged 8 and 7 years and a girl aged 3 year. A few months ago she was totally unaware about the importance of family planning, child spacing and immunization. Shahin was approached by one of the CHEs from Swabhiman. After continuous counseling and follow ups for over 4 months, Shahin understood the significance of family planning, child spacing and immunization. The guidance by CHE about the whole process of permanent contraception for women i.e., tubectomy eventually convinced Shahin to opt for the same. She recently got tubectomy done and is happy that she could take necessary precautions and proper care of her health. I don’t feel I am any less than others and the Swabhiman scholarship has not only empowered me but has also given me more courage. Convinced by a team of volunteers from Swabhiman programme to send her to a school Nidhi’s parents are now extremely proud of their daughter’s achievements. Her physical constrains have never deterred her from performing outstandingly well in academics. Hailing from a family of seven members, her parents never wanted to invest in educating her because of the financial difficulties at home, but her strong determination and the support of the Swabhiman scholarship changed the entire story. She says that History is her favorite subject and she wants to become a teacher of the subject when she finishes her studies. Parul’s mother does labour work at construction sites with her husband. She works just as hard, but gets paid only half of what her husband earns. 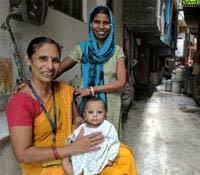 Parul’s mother does labour work at construction sites with her husband. She works just as hard, but gets paid only half of what her husband earns. It was with these meager wages that she started sending her daughter to school, even though her husband was completely against the idea. From the very beginning, Parul made her mother proud as she excelled in school, always coming first in class. When she secured 84% in her class 12th exams, even her father could not hide his happiness. At present, Parul is studying Hindi Literature at Delhi University, and hopes to become a professor soon. 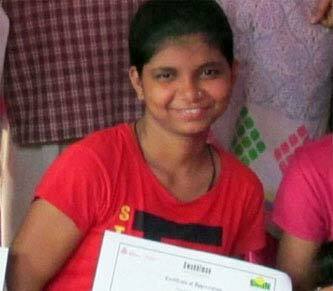 Parul received a scholarship under the Swabhiman programme which is a result of her hard work and she is one of the 92 exceptionally talented girls who are getting scholarship under Smile Foundation’s Swabhiman programme. Parul wants to take her mother on a vacation when she gets a job because without her support she could not have grown up as a strong individual like she is now. "My mother wants me to have a job. She always wanted to work but she never could. I am going to make her proud." 15-year-old Rukhsar is probably not the only girl who wants to fulfill her mother’s dreams. Her mother Mussarat has always been encouraging her to focus on education. My mother wants me to have a job. She always wanted to work but she never could. I am going to make her proud. 15-year-old Rukhsar is probably not the only girl who wants to fulfill her mother’s dreams. Her mother Mussarat has always been encouraging her to focus on education. She could never work because she had to be busy with household chores before and after marriage. She has till date never sought any help in household chores from her daughter. As a result, Rukhsar performed outstandingly. She has excelled ion studies and is equally good in co-curricular and got scholarship under Swabhiman programme. She wants to become a teacher when she grows up and encourage other under privileged girls like her to chase their dreams. "My father does not understand English but he loves to hear me use it." A temporary driver struggling for the survival of his family of six, Shalu’s father never thought of enrolling her in school. My father does not understand English but he loves to hear me use it. A temporary driver struggling for the survival of his family of six, Shalu’s father never thought of enrolling her in school. But only one meeting with Mission Education project coordinators was enough to convince him that education could be his daughter’s way out from the life of poverty and drudgery. Shalu studied at the Mission Education centre for 10 years and because of her hard work and diligence was successfully mainstreamed to a prestigious private school in Delhi. 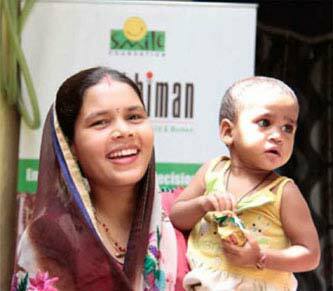 She was also awarded a scholarship under Smile Foundation’s Swabhiman programme to complete her education free of cost. Presently, Shalu is aiming to get admission to a reputed college in Delhi University and study child psychology. She regularly visits the Mission Education centre where her journey started and spends a lot of time with the younger children there – helping them, playing with them, teaching them. "I was sick for the longest time and had lost all hope of giving birth"
Due to her husband’s repeated demands and the constant pressures from her family for a child, Neetu had conceived four timers in two years but was unable to give birth due to her failing health. Due to her husband’s repeated demands and the constant pressures from her family for a child, Neetu had conceived four timers in two years but was unable to give birth due to her failing health. The family did not seek any good medical help and she kept on suffering. Neetu had lost all hope when volunteers from Swabhiman came to know of her condition. They immediately sought medical advice for her and repeatedly counseled her husband, making him realize his responsibility towards her well being. Neetu began paying attention to herself, taking a healthy diet, and in no time started blossoming again, with her husband by her side. She is six months pregnant now and ready to experience a happy motherhood. Shahid had grown up in a society which believed that boys were superior and girls were only fit to be married and bear children. I never realized that girls were equal to boys until now. Shahid had grown up in a society which believed that boys were superior and girls were only fit to be married and bear children. Shahid himself is the father of three girls and kept on pushing his wife to conceive again hoping for a boy this time. Shahid’s wife was very young when she got married and after three children coming at close intervals her body could not bear the stress anymore and she began to keep sick. It was only after the street plays and counseling sessions conducted by team Swabhiman that Shahid came to know that girls are as able if they are nurtured and educated properly and the health of his wife could improve if proper measures are taken. Shahid is now the proud father of three beautiful daughters and has big dreams for them.